I remember how surprised I was the first time somebody dismissed my opinion by calling me “just a granola.” The opinion I had expressed was about a décor—too much chrome, I had said, too many hard, bright surfaces, too black and white. Oh you’re just a granola. How could I argue with that? Earth tones and firewood remind me of home. Incense and yoga cushions make me feel welcome. But just a granola? I thought my combat boots and skirts-like-curtains were evidence that I followed a higher calling. Just a granola? Excuse me while I clean my granny glasses and adjust the fringe on my beaded shawl. Just a granola? Try as you might, it’s impossible to belittle or minimize me by calling me a granola, because I make The Best Granola in the World. I will tell you how, and then you can make The Best Granola in the World, too. Tacked to the wall of my kitchen is a scrap of paper older than the kitchen itself. It lists the granola guidelines. I hesitate to use the word recipe because local taste, local conditions and local inspiration are critical in the making of The Best Granola in the World. The guidelines prevent your creativity from sending you too far off the mark. They say: a half cup of honey, a stick of butter, 5 cups of nuts, 4 cups of fruit, and 16 cups of oats. Right off, I have to admit that’s not exactly what I use anymore. I mix equal parts rolled oats and rolled barley together and measure out 16 cups of that. Because I like it better that way. But that part’s not ‘till later. First you’ve got to make the slurry. Melt some butter and some honey in a big pan. Think about what else you can add. A package of forgotten fruit from the bottom of the freezer is always good. A glop of peanut butter perhaps. Traces and dashes of secret ingredients—vanilla, cinnamon, salt. A homeopathic dose of unsweetened chocolate. Fruit juice. An overripe banana. Maybe you need more honey. Maybe you’ll need less. Stir and heat the slurry until it’s fully mixed and melted, then add enough water to make about 3 quarts. Grind up the nuts. Whatever kind of nuts you like—or can afford. Sesame, sunflower and flax seeds count. Pour the nuts into the slurry and heat it until it’s ready to boil like hot lava. Now for the oats, or whatever you are calling oats. In a great big mixing bowl, layer the them with the nut slurry. Stir everything together, and then let it sit to give the oats time to absorb the juicy goodness. Next you have to put it on cookie sheets and toast it, which will be a personal education in the functioning of your oven. Maybe you should work with your oven heated to 250, or maybe 400 will be the best temperature for you. It just depends on the oven, how even its heat, how moist the granola, and how much patience you have. The trick is in knowing that just before the nuts and grains start to burn, some of the carbohydrates turn to sugar and that’s is the instant the granola is most perfect and delicious. Of course, after it starts to burn, there’s nothing perfect and delicious about it. 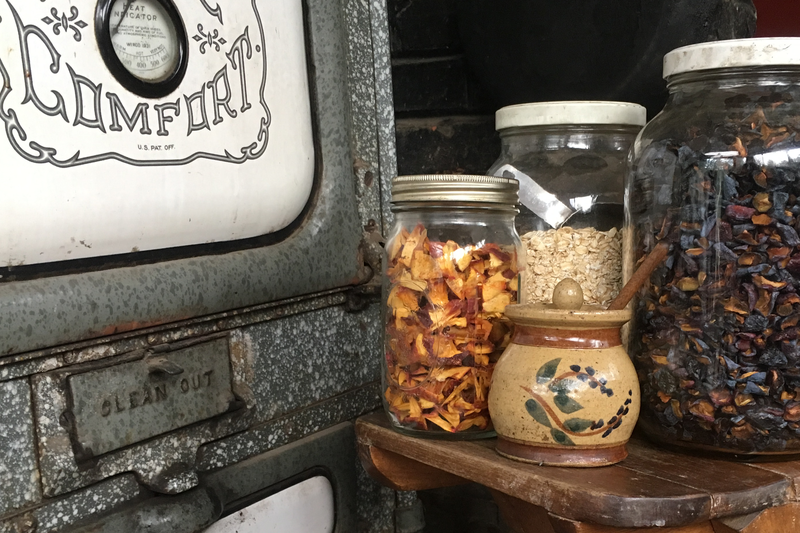 With some attention, you’ll figure out how much granola to put on the cookie sheet and at what temperature to toast it and for how many minutes until the rhythms fall together and your kitchen is pumping out fragrant, toasted granola. Let it cool. Mix in the dried fruit. About 4 cups. You can tell when it looks right. A little coconut is nice. Raisins will work. For The Best Granola in the World, however, you must use local fruit. Where I live, that means sweet cherries, nectarines, pears, and apples. Dry the fruits as they come into season, cutting them into pieces that will shrink to the size of raisins. When people ask me, What on earth are you going to do with all that fruit? I tell them that I will be using it to make The Best Granola in the World. It really is The Best Granola in the World. You couldn’t have it on a higher authority. Because it takes one to know one.